High-end mobile apps have created a boom in the world with its high-tech features & functionality. From a startup to unicorns, apps have a miracle to spread its magic on every spectrum. Understanding the needs of users in utilizing innovative apps have inspired mobile app developers to explore their creativity level in new edges, effectively. The gigantic requirements of apps lead mobile app developers as well as mobile app development company towards the app development. Now, the question pop-ups that, there are many app development platforms for any Smartphone, but which one is to choose from Android & iOS app development platform? If we talk about the market share of iOS & Android then Android rules with 84% while iOS is with 15%. Since developers want to develop apps that generate revenue, it is important to recognize which OS supports the maximum buys. A recent report says that on average iOS apps make 75% more money than Android counterparts. Must be, this reason should be enough for those who are seeking for the app development for their business because most of the app developers & mobile app development companies hope their app can be accessed by many people in the world. Let us have a look at the statistics on the top categories where iOS ranked on high. The statistic shows the most popular categories in the Apple AppStore ranked share of active apps. In September 2018, business apps were the second-most popular category, with a share of 9.77 percent of active all apps being business apps, which was on the first position in October 2014. But In 2018, Gaming apps are the most popular based on availability, as 24.86% of all apps available fit in this category. 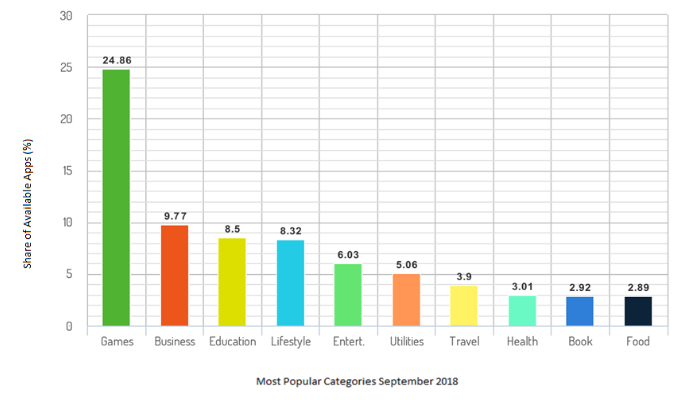 In addition, iOS apps have taken the place among various industries such as Education with 8.5%, Lifestyle with 8.32%, and Entertainment with 6.03%, Travel & health-care with 3.9% & 3.01 on the AppStore. An iOS app development guide helps developers to keep in mind important factors need to consider while developing an app such as App architecture & design, Performance tips, app lifecycle, deployment, and many other aspects. In the standard of the ideology of developing an iOS app, structure planning is a crucial part of any project. So, structure planning must be done in a proper way otherwise things can be diverted in the wrong path. In this phase, an idea and the list of “What the app is going to do” or “what to know before developing an app” is a mandatory element that should be in your mind. Once you have decided the required element of app development, and then set the purpose of the app. Apple users spend more money on their Smartphone and its app. They will surely expect the app to be an outstanding one. An in-depth research is a required task for iOS app development. The research will clarify the need of the app in the market that you are going to develop. This research will provide information about the uniqueness of your application. Whether there are other apps available in the market, same as yours with the same design & features. Through research, you can find out the technical requirements, and the market to monetize your app. Wireframes are UX-(User experience) roadmaps that demonstrate user options and contain an information architecture blueprint. Hence, the accurate & flexible wireframing of apps are required to make apps flexible for the user. Moreover, comes to designing, to create an appealing visual design, an intuitive UI (User-interface), as well as engaging UX is essential to make a simple & interactive design. In this portion of the development, the designer needs to work on screen features & generates the design prototypes for a development team. The simple & unique design will lead to a better user experience. Coding decides the level of application. The high-tech coding decides how much your app is convenient. Several coding languages are present for iOS with flexible & robust features. If we talk about programming languages then Swift is a powerful and easy to understand language for iOS, which is fast, secure & reliable also. It helps iOS developers to develop iPhone or iPad apps. This phase provides extra value to your app in the app development process. As mobile apps are developed to be functional, sensible & interactive, it is quite beneficial for the iOS app developers to add some offer or benefits providing features in the app. This will drag the attention of the user towards the application that he could find some benefits from them. It is considering as a marketing feature too & comes under iOS app development best practice. The actual price of an app can be calculated on the basis of the development time & development cost of an app. Addition of in-app purchase option makes the user buy additional features for the app directly from the App Store. Pricing is done, now time to the promotion of the app. Promotion of the app is the major part that holds a key to success of the app. Promotion phase will occur after analyzing the target audience. The key rule to make your app more popular among the user is- “Promote there, requires where”. For beginners, we hope that this guide was enough for refining all the queries related to the iOS app development. 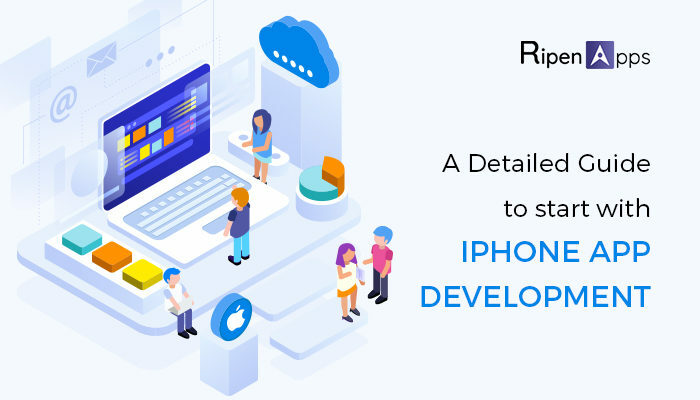 If there is still some queries running in your mind related to iOS app development then, RipenApps is the top iOS app development company and we will surely convey our expertise or insight to you. Feel free to Contact us or email us at info@ripenapps.com. We will assist you with our in-depth knowledge.